The flutter kick is a popular and common exercise; swimmers are most familiar with the flutter kick/freestyle kick. 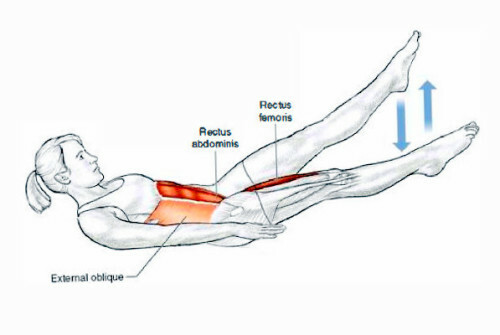 This exercise primarily uses the the lower fibers of the Rectus abdominis (abs) and the rectus femoris (quads), it also engaged the (obliques) external oblique, internal oblique, transversus abdominis (side abs), and the iliopsoas (hip flexors). 1Lie on your back with your arms at your sides. 2Tighten the abdominal muscles, make sure your lower back touches the floor, there is no space between your lower back and the floor. 3Lift your shoulders 4 inches (10 cm) off the floor. 4Lift your feet 12 inches (30 cm) off the ground, keeping the low back on the ground. 5Flutter kick for 60 seconds or until you are unable to keep the low back stabilized on the ground. Question: What happens if I feel in it in my LEGS and HIP FLEXORS more so than my abs? Answer: If you feel the the burn/work load in your legs and or hip flexors a lot more than in your abs – it could be that the low back is arching, check your posture. You are no longer working all of the muscles simultaneously, mentioned above, and is being taken over by the hip flexors, meaning the hip flexors are trying to do the work for the other muscles . Remember to keep the low back on the floor, this keeps the abs sucked in. Ready to give it a try?